On a recent edition of his Akimbo podcast, Seth Godin1 discusses why math in the real world doesn’t line up with the subject taught in school. In his monolog, Godin argues that everyone is good at math since most of us use the concepts everyday without necessarily thinking about the “math” involved. He illustrates his point using the Monty Hall Problem, a probability puzzle related to simple choices, based on the game show Let’s Make a Deal and named for its long-time host. The whole episode is worth a listen2, but, as a former math teacher, I found his introductory remarks about those math classes particularly interesting. Math class might be hard but math… math isn’t what we think it is. One reason that math class feels hard is because math isn’t what they teach in math class. It may be that you think you are no good at math, but you are probably mistaken. You might mean that you are no good at arithmetic, because arithmetic is boring and you know how to arithmetic with a computer. It might be that you’re no good at memorizing formulas that make no sense to you. And that’s probably a good idea, because of all the things to be good at, memorizing formulas that make no sense to you is not one of them. School was built to create people who could do well on tests, and so quote math unquote educators (also in quotes) decided that the easiest way to have people do well on the tests was to teach them arithmetic and have them memorize equations that they didn’t understand. I’m not sure I agree that the concept of school was built around testing, even though that’s what it’s become. However, his assessment of the content of math class is far too accurate. The math curriculum used in most schools really is based on arithmetic. It’s repetitious, most of the problems done on their smartphone, and it is pretty boring. When students get to high school and the titles get narrowly specific (like Algebra), the formulas become more complex but the process is still mostly a matter of arithmetic (we just stick letters in place of the numbers) and memorizing. And also still largely boring for most kids. Let’s face it, there is much about K12 education that is out of date and in need of a complete re-think. The concept of “math class” would be a great place to start. 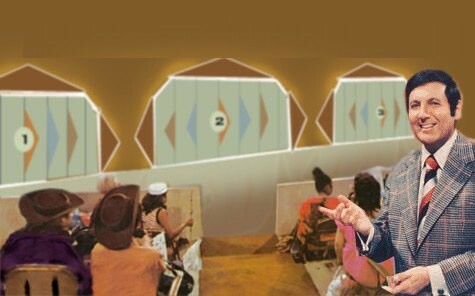 The picture shows Monty Hall with his famous three doors (occasionally curtains) that were incorporated into the problem. Although he was going strong as host of Let’s Make a Deal when I started teaching math, I didn’t learn of the problem named for him until much later. 1. Godin is a popular business writer whose daily blog, books, and other work often include some insightful observations that apply out here in the real world. I find his writing on education is sometimes too simplistic but it still provides some good thought material. 2. The math discussion is in the first fifteen minutes. You can probably skip the question and answer section (plus a promotion for his online course) in the second half. 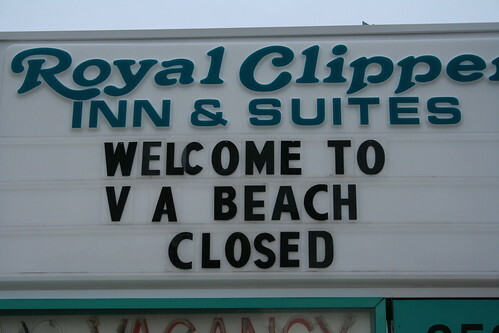 Unlike the Microsoft ebook store, this hotel probably reopened when after winter was done. Several years ago in a photography workshop, the leader told us that he never used the phrase “taking pictures”, preferring instead “making images”. Besides sounding a little like theft, he said that “taking” was too passive for what we were trying to do. Making photographs is more of a creative process, rather than a one-shot deal.1 And that is how we should approach our craft. This variation in the way we speak of photographs often jumps into my head when following discussions about maker spaces and Maker Faires. Why isn’t photography included in maker space activities? Why aren’t photographers demonstrating their craft at a Maker Faire? When the concept of “maker” is addressed, most people include things like robots, 3D printers, coding, and other things electronics-related. Drones? Sure. Welding, puppets, and paper craft? Why not? Even VR and AR, which are still largely out-of-the-box activities that are not easy to make. Making good images, those that evoke some kind of response from the viewer, requires thought and planning on the part of the photographer. And that creative process is very accessible to almost everyone, even more so than some of the higher profile maker space components. Ok, just something to think about when considering who and what is a “maker”. The picture, made at the 2018 Maker Faire NoVA, reminds me that making music is also often missing from the concept of maker spaces. 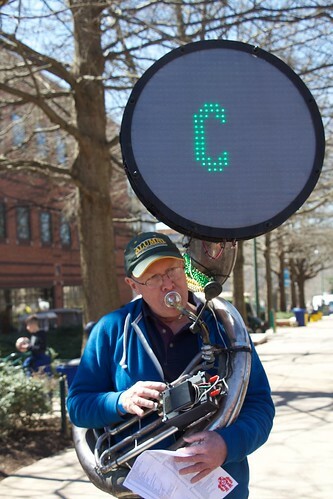 Although I think his tuba was more about the technology than the music. More pictures from this event are in this Flickr gallery.